I bought the It Cosmetics Your Je Ne Sais Quoi Complexion Perfection Face Palette that was just release for the holiday season. Since decluttering my makeup collection from last year, I have decided to stick with only products that I know I love regardless of the price tag, products that are convenient and products that work. I love products that come in palettes versus singles. While yes, not all palettes are worth their weight in gold, especially if the palette simply puts their old shades in one compact (yeah, I'm looking at you Hourglass and your holiday palettes!! ), I love palettes that can offer me a range of products where I can cover my whole face with one compact versus having to use or travel with different makeup products. 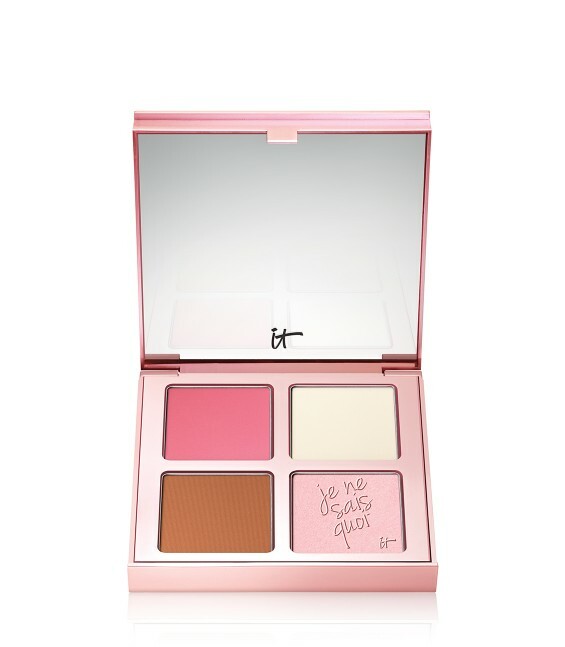 Your Je Ne Sais Quoi Complexion Perfection Face Palette is great because of its versatility. I love this palette especially for travel and on the go. It comes with a matte bronzer, new highlighter that doesn't have glitter or sparkle in it! A new blush color and their famous Bye Bye Pores Pressed poreless face powder. 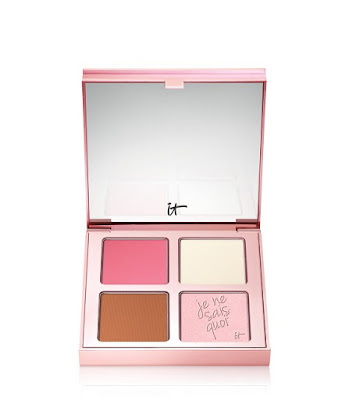 This comes in a beautiful rose gold compact with four large square pans that give you tons of product. Lately a lot of makeup companies are charging more for their products with less product quantity in it. This isn't like Hourglass and their holiday compact palette of last year (yeah, still pissed about that) where you couldn't even get a brush into the pan to pick up color without picking up two colors due to how small the square space was. These pans are so big that you can fit a full size blush/powder brush in them! The bronzer is a matte color that doesn't pulling orange or red. Its more warm then cool tone. It can be used to warm up your face and even to contour if you are looking for a subtle look. 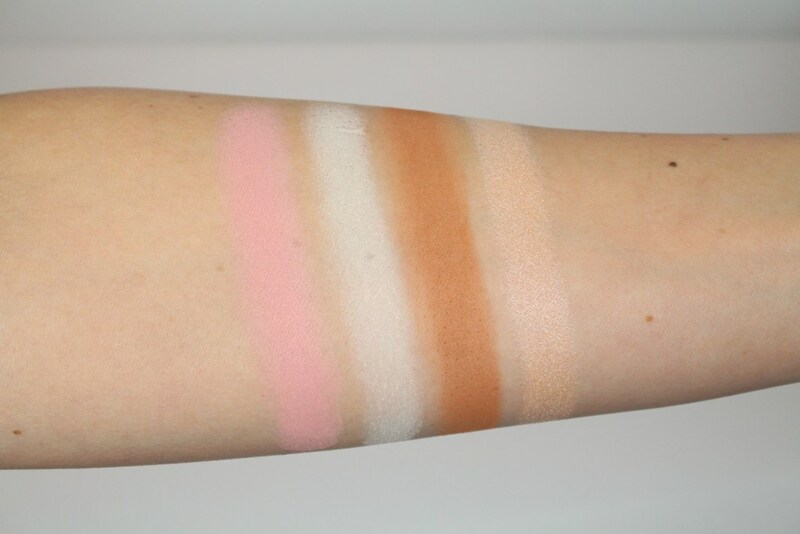 The blush is a great matte medium light pink color that goes with just about all complexions. While the color is a medium pink tone, it applies very light to the skin so you need more than a few taps of the brush for it to show up. It does blend out very well and leaves a lovely natural wash of color on the cheeks that looks as if though you woke up this way! The highlighter is a nice pinkish/peach (gold tone) highlighter without all the glitter, sparkle or obnoxious look that some highlighters give off. It really does give a lite within color. The point of highlighter is to make you naturally look lite without the disco ball effect. Don't get me wrong, I love my disco ball effect every now and then, however it isn't always appropriate especial for day time and/or office wear. The press powder give you a poreless effect which helps to blur imperfection and leaves a no powdery look. It works great to set your makeup after your foundation or after you have applied all your makeup. The fallout is literal none and the color can be picked up with a few taps from the brush. The ONLY draw back with this palette is that I don't see this showing up on medium to dark skin tones due to its light colors. 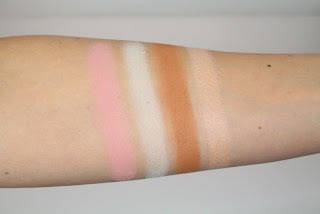 Though It Cosmetics claims that this can be used on every skin tone, however with the lightness on these colors, I don't see this showing up (without a lot of effort and product) on darker complexions. While the color payoff is great, however only on fair to light skin tones. Sadly a lot of companies still don't realize that one size does not fit all when it comes to palettes and skin tones. They should have made a second palette that was a bit more on the darker side for individuals who are not fair to light skin tones. Outside that one issue, this palette is prefect for on the go and I plan to keep this at my office for those days when I am running late and can't apply my makeup at home! For all my Canadian customers, you can buy this palette from The Shopping Channel and have your option of getting it with their Heavenly Lux Wand Ball Brush ($59.00) or without and you simply just get the palette ($52.00). I bought it with the brush for a few dollars more! Have you recently tried this new palette? Let me know what you think down below!! Ah powders! There are so many powders out on the market that one could literally search for days and be left with endless possibilities. Which is a good thing I might add because it allows all skin tones, complexions and skin issues a chance to find their right fit. However, in the last few years not only have setting powders become big, but so have finishing powders as well! 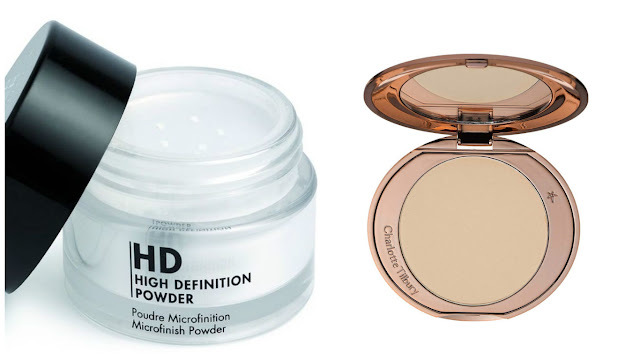 So you might be wonder like the rest of the free world, what is the difference between a finishing powder and setting powder and why, oh why do I need it?! The truth is, you really don't need any powder at all if you don't really fancy it. However setting powders and finishing powders can do wonders for your makeup when used correctly! 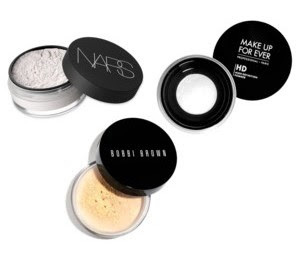 Setting powders are used to plain and simple set your makeup after you apply foundation. Since foundation can cake, rub off on clothes, move around or slowly disappear throughout the day, setting powder helps to keep it on your face without going anywhere more or less. Setting powder can be purchased either in translucent or with a bit of color to them. Be careful on the powders with color because they can change the color of your foundation once applied. On that same note, always check out translucent powders before you buy them. Some can leave a whitest cast on some skin tones. So always try out a face powder before buying regardless if you are using one with color or not. While setting powders can be used to set your concealer, I highly recommend getting an actual setting powder that is made for concealer because some of these powders can really settle into your fine lines underneath your eyes. 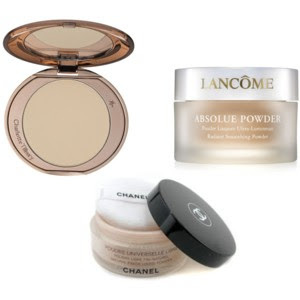 Moreover, when buying a setting a powder, whether it be drugstore or high end, always look for one that is finely milled. Finely milled powders leave your face looking as if you have nothing on and work great to give you a no powdery makeup look. They also don't settle into fine lines or cake up very easily. Non finely milled powders can leave you looking like you dunked your head into cake batter, will cake up and cause massive settlement into fine lines. Finely milled powders also help to blur imperfection and give you that airbrush glowly skin effect that we all so desire! Setting powders can be bought in either a matte or dewy type finish. Also ready the label, asking questions to the sale associate and/or try out the powder on your face (not your hand) so you know exactly what you are getting before buying. I love a dewy radiant finish so I never buy anything in a matte setting. Finishing powders are constantly confused with setting powders. And for those who have confused them before in the past....well let's just say "a picture is worth a thousand words" (Yeah, I am looking at you Nicole and Drew!!) Finishing powders are used to set your WHOLE makeup at the END of your routine. So after you apply your foundation, setting powder, eyeshadow, blush, bronzer, highlighter, blah blah, etc etc (cause you know some of us use at least 20 products before we call it a day) is when this powder would go on. Right at the last step. However, if you use a setting spray, then that would go on after your finishing powder. Confused yet? Finishing powder is not meant to set your makeup, but instead to give you a 'prefect blurring the lines complexion' effect due to its micro-finish HD properties that the majority of these powders have. These Micro-finish properties allow for pores to look evened out and blurred plus gives you a radiant glow. When applying a finishing powders, a fan brush is the best way to go. Don't use a normal round big face powder brush because that will pick up to much product and leave you that possible white cast. Instead opt for a fan brush. 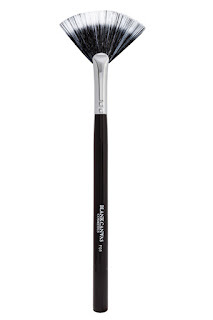 I always reach for my Blank Canvas F05 Fan Brush. A fan brush allows for just the right amount of product to be picked up and distributed throughout your face evenly. It also helps to remove any excess powder you may have applied without disturbing your makeup. So there you have it, my review on the differences between setting powders and finishing powders. Do you have a setting or finishing powder that you love? Let me know down below! !